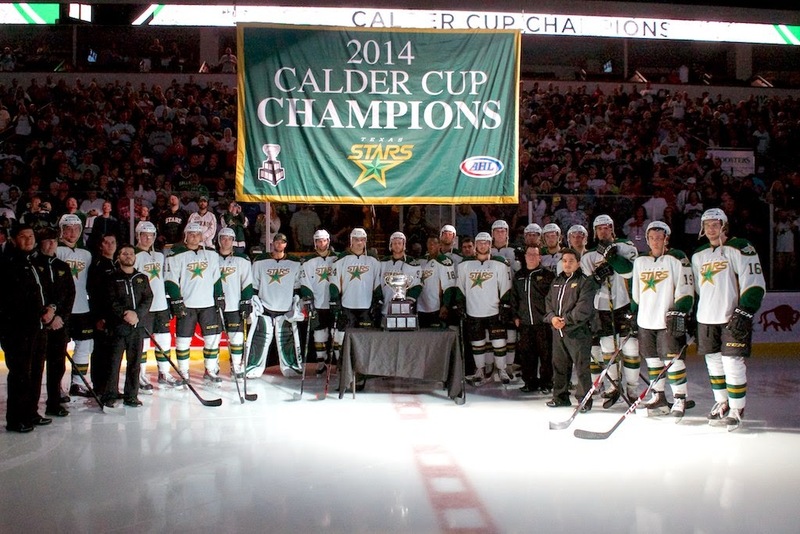 How Did the Texas Stars Black Aces Get on the Ice for the Calder Cup Celebration? This was a fun story that got missed in the shuffle of all the end of year stuff last season. Goalie Josh Robinson tells the story of how the Texas Stars' black aces made it onto the ice (in full gear) for the Calder Cup celebration. The Stars mini-series against the Barons is not turning out as well as last year's playoff matchup. Through three games, OKC has taken two of the contests and lit up the Stars offensively in the process. 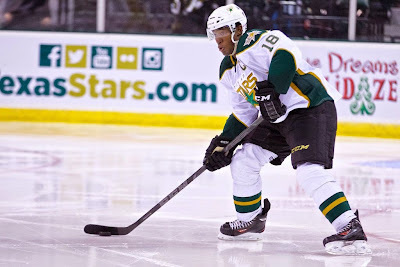 Despite a four point night from their leading scorer, Travis Morin, including a hat trick, the Stars ended up on the wrong side of a 6-5 OT score after trailing by three in the third period. "It's tough to lose it when you expend a lot of energy in the third period to get back from a 5-2 deficit," said Coach Derek Laxdal. "You have to give the guys credit. That's a big point you didn't have going into the third period." By the end of the first period, the Stars were down by two. At the end of the second, it was a three goal margin. Yet still the club found itself in overtime thanks to the efforts of vets Travis Morin and Greg Rallo. "We obviously weren't happy with the first two periods," said Morin. "We wanted to push the pace and the tempo and throw everything at them." A shift at forward to put Derek Hulak on a line with Morin and Brendan Ranford immediately bore fruit. Hulak had the primary assist on two goals in the first five minutes to set the difference at just one. "When it gets down to one goal there in the last few minutes, that's the time to send everything really. We were doing whatever we could to try to get two points." Greg Rallo tucked it under the crossbar from the left wing side with just 1.9 seconds left in regulation. 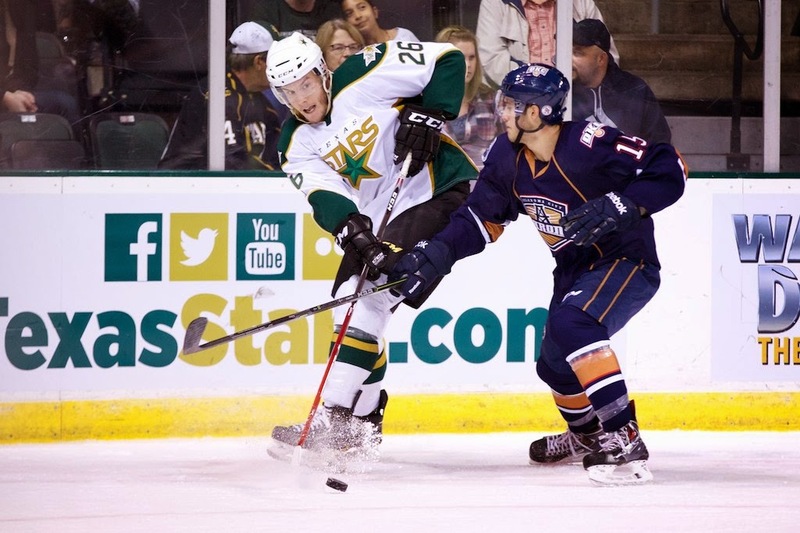 After the dry scrape, the Stars and Barons made it to 3-on-3 OT for the first time this season. It was Matt Ford of OKC scoring there on a 2-on-1 play for the win. Coach Laxdal summarized the game saying that his club needed to tighten up defensively and get better on special teams. While Texas had the opening goal of the game, they gave it back almost immediately. 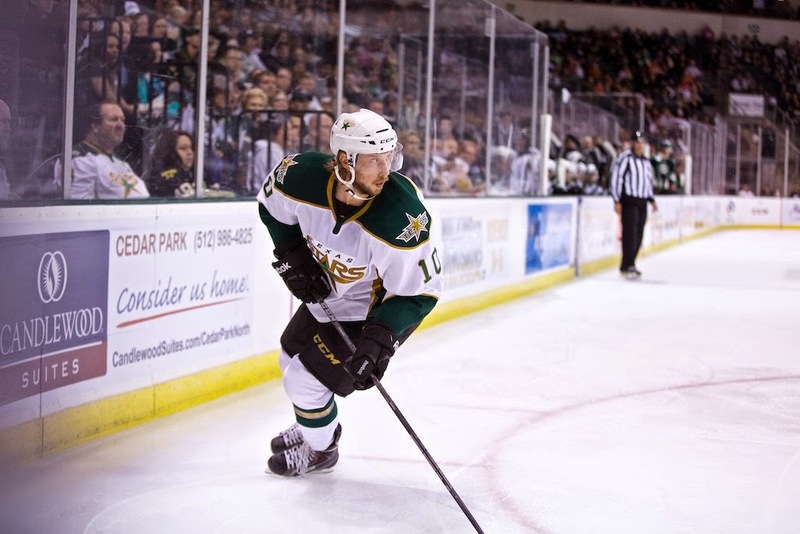 Travis Morin scored through the screen of Brendan Ranford for the 1-0 mark. Just as quickly, Dillon Simpson slapped one through traffic for his fist goal of the season. OKC continued their march on the power play with a slick strike from the left wing circle by Andrew Miller. An odd man rush a few minutes later would make it 3-1 for the visitors. 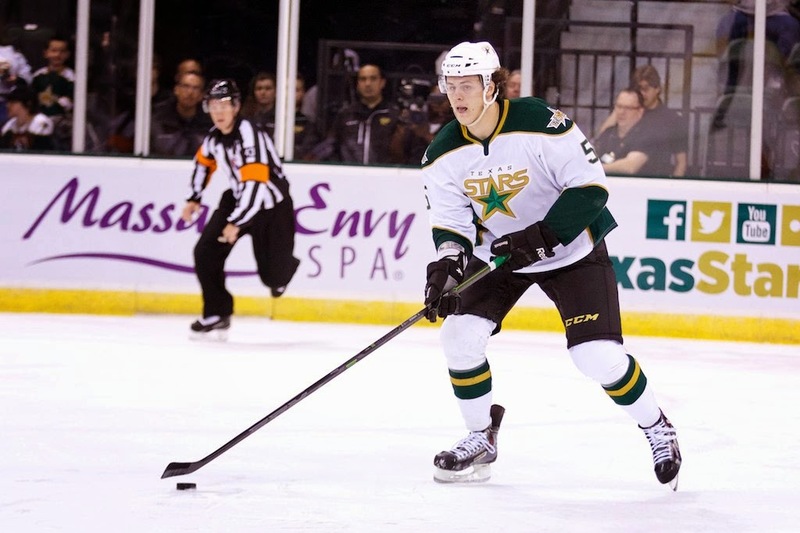 A tough defensive shift out of Julius Honka led to the Barons' fourth goal. He was unable to navigate a clear which out Texas on its heels. The Stars got a power play at the midpoint of the period, a spot where they pretty much had to have a goal to stay in it. From the right point, Derek Meech did that just as the advantage expired. 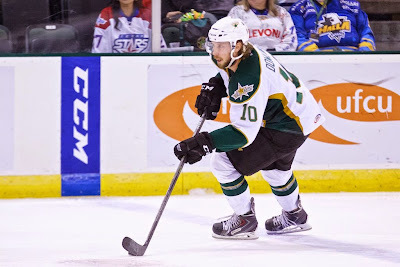 Unfortunately, Anton Lander scored on the backhand on a breakaway to kill the momentum for Texas and put OKC back at their three goal lead. "You have to have a huge bump shift there," said Laxdal. "You have to have big saves at the right time in the game and the line that goes out there has to know this is a big shift to gain some energy." 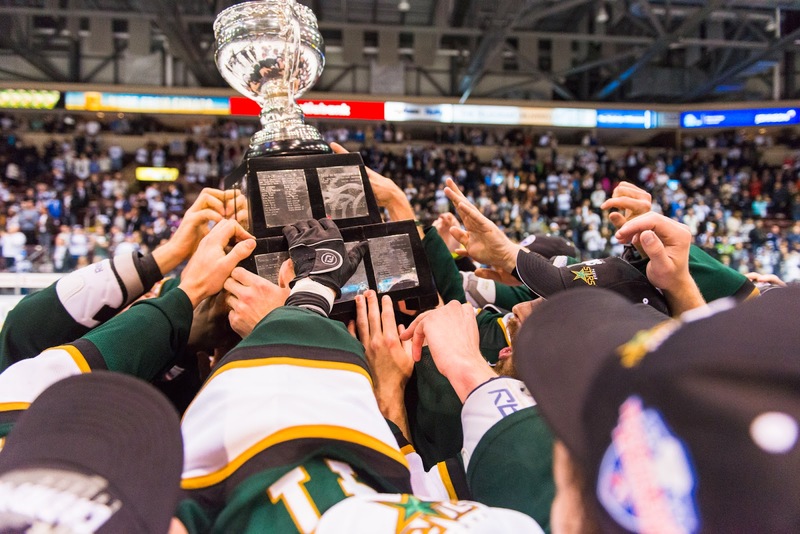 Travis Morin's aforementioned heroics brought down the hats at the five minute mark of the third and set up a frenetic final fifteen minutes of regulation. Going 6-on-5 for 99 seconds, the Texas Stars found the game tying goal off the assist of Travis Morin. It was a nice cross-ice pass by Morin that found Rallo and gave him a shot at the net with just a few seconds remaining. The Stars went to OT and then 3-on-3 OT. Laxdal chose a two forward look. "Our forwards were creating a lot of energy and we taxed our defenseman in the third." Ford got the best of Texas for the 6-5 final. Texas plays OKC again on Wednesday. Same teams, but Texas hoping for not the same result. 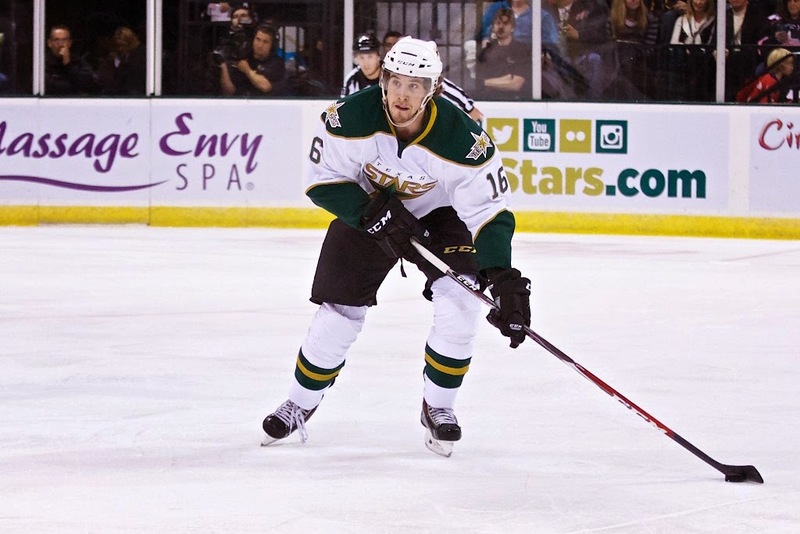 Texas needs to look out for Jason Williams and Iiro Pakarinen. The two newcomers to the squad combined for 5 points last night. Old hand Tyler Pitlick had 3 as well. 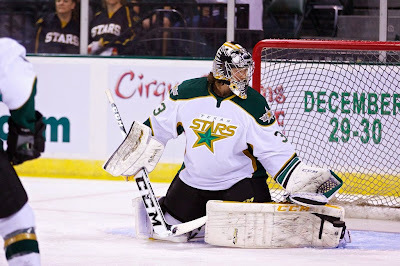 One would assume Jussi Rynnas gets the start for Texas while Laurent Brossoit laces them up in net for OKC. No morning skate today for either team because of the long travel (by bus) to get here today. Last weekend, Texas arrived into Cedar Park at 4:30 AM after their Friday night game in Bricktown. At least this time both teams will have the same plight. The Texas Stars could not overcome a three-goal second period from the Oklahoma City Barons and suffered their first loss on the young season. The final score was 5-3 for the home team Oklahoma City. 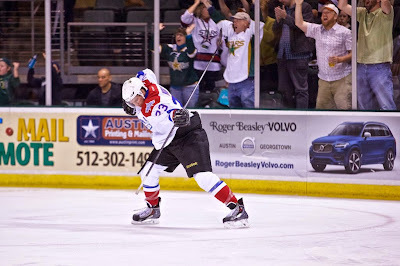 Texas was plagued by ill-timed penalties that broke up momentum and gave the Barons two power play goals. 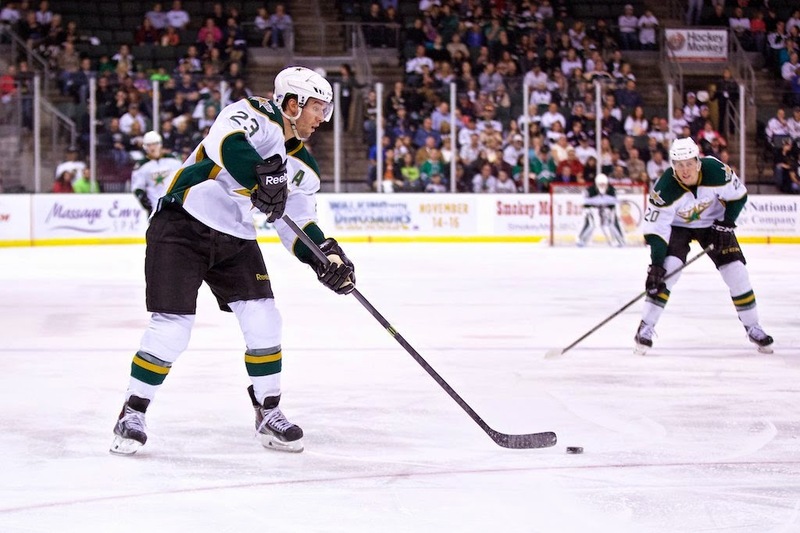 Jack Campbell took his first loss of the season, giving up five goals on 26 shots. 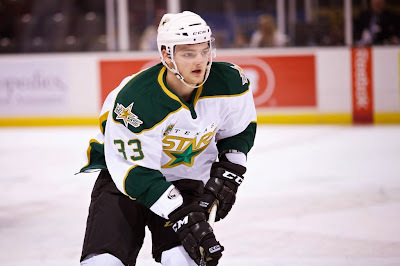 Goal scorers for the Stars in the contest included defensemen Cameron Gaunce and John Klingberg. Travis Morin picked up his 200th AHL assist and 300th AHL point in the loss. The game showed that Jason Williams and Iiro Pakarinen are going to be tough competitors for the Barons this season. OKC will play Texas a total of twelve times this season. 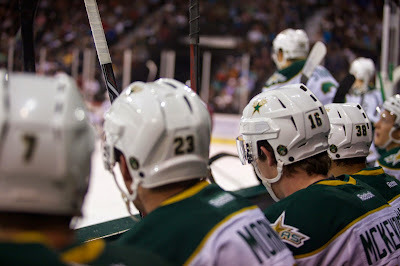 The Texas Stars appeared to be ready to continue their undefeated ways in the first period, putting 16 shots on net. The period ended tied at one anyways. A slap pass by Keith Aulie was redirected by Jason Williams for his team-leading fourth goal of the year by the Barons. As the period was ending, Cameron Gaunce's shot from the point blew by Frans Tuohimaa with Brendan Ranford in close to cause havoc. 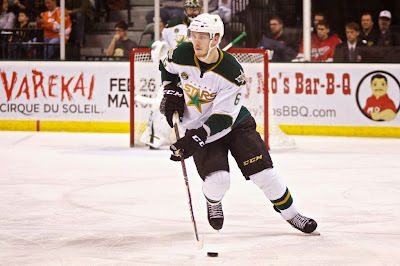 Morin was the only assist on the goal, his 200th AHL assist and 300th AHL point. The second period collapse for Texas began on the penalty kill. With Gemel Smith serving a too many men penalty, Iiro Pakarinen got a one-timer off the pass from Jason Williams and went up 2-1. Just 28 seconds later, Curtis Hamilton's goal off a 3-on-2 rush by the Barons made it 3-1. 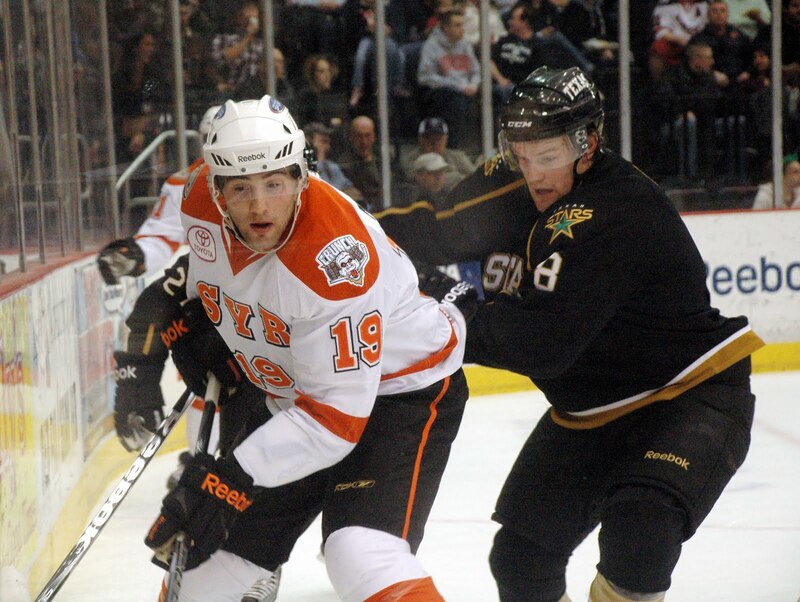 William Wrenn, in his first game of the season, attempted to rally the troops with a spirited fight against Travis Ewanyk. It wouldn't work as Tyler Pitlick snapped in a rebound for his first goal of the year at 11:20. Williams had another assist on the play. 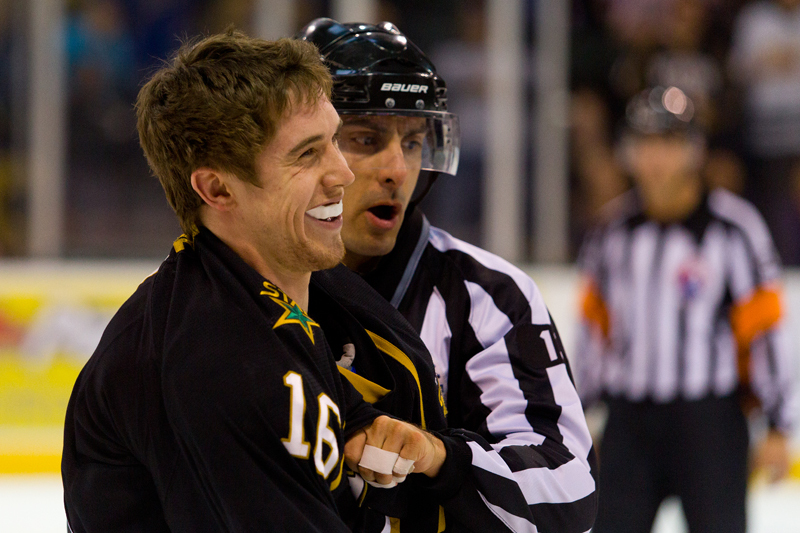 The Stars would break up the run on Jack Campbell with a goal of their own in the last two minutes of the second. John Klingberg found twine down low with assists to Justin Dowling and Brett Ritchie. The third period would bring another power play goal for OKC's Pakarinen. Straight off the faceoff win by Anton Lander, the rookie found his fourth on the young season. Things got a little wild late as Steve Pinizzotto went to fight Taylor Peters after a stoppage of play. 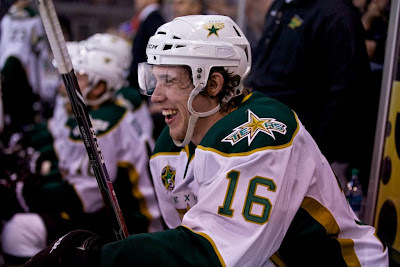 He picked up a five minute major for cross-checking in the kerfuffle and gave the Stars a huge chance to even things up. Travis Morin took advantage of the opportunity, snapping one past Tuohimaa to make it 5-3. Derek Laxdal pulled Jack Campbell to make it 6-on-3. It wouldn't yield rewards as Texas ended the game with the same two goal deficit. These same two teams will hit the road and play in Cedar Park tomorrow night. Regardless of the outcome of last night's game in Dallas, it was going to be a special and meaningful one thanks to the connection forged this summer between Vancouver and the Stars. 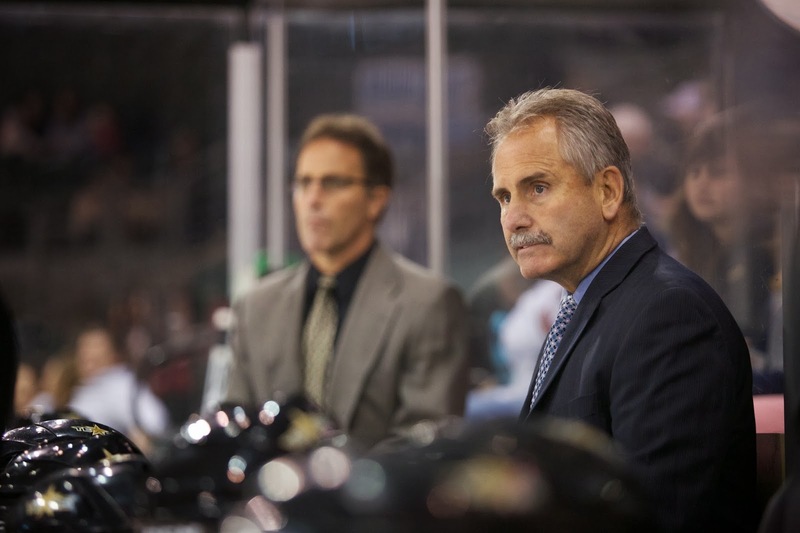 After leading the Texas Stars to the Calder Cup, head coach Willie Desjardins and assistant coach Doug Lidster were scooped up by the Canucks to lead the squad after a disappointing year. Last night's contest at the American Airlines Center was the first time Desjardins and Lidster coached against their former organization. "It's a special game for me," said Coach Desjardins yesterday before the game, a 6-3 Dallas victory. "This is a good organization. I know a lot of guys in the organization, so it is a special place. Right from the start, I knew when this game was going to be." Desjardins was plucked out of the WHL by Dallas for an associate coaching job behind Marc Crawford in 2010-11. The Crawford era gave way to the Glen Gulutzan era in 2011-12 and Desjardins stayed behind the bench in Big D. He had been in the conversation for the Dallas job but needed that head coaching professional experience according to many. 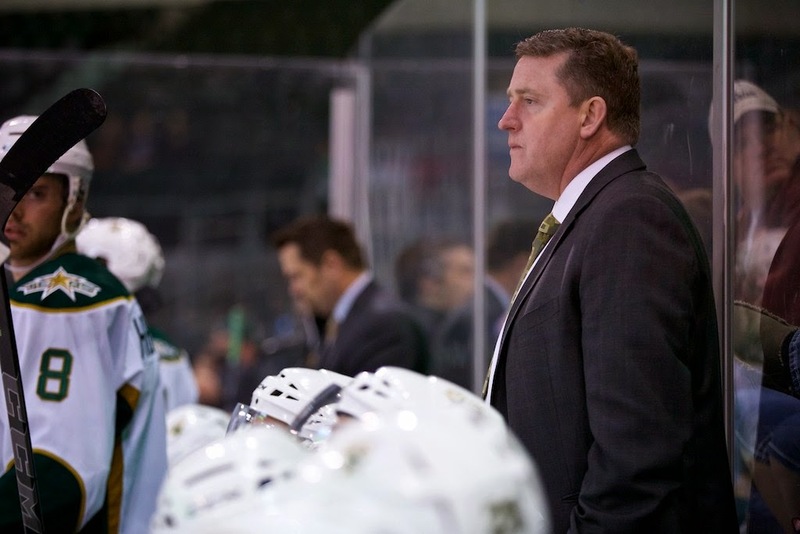 He got that experience when he took the helm in Cedar Park for the 2012-13 season. It was a peculiar season thanks to the NHL lockout but one that ended in Texas clinching the first seed in the West. An unceremonious exit in Game 5 of the second round gave the team's returning core fuel for a 2013-14 that ended in a Calder Cup. Coincidentally, one of those who hoisted the Cup in June for Texas played just his second NHL game against the Canucks last night. 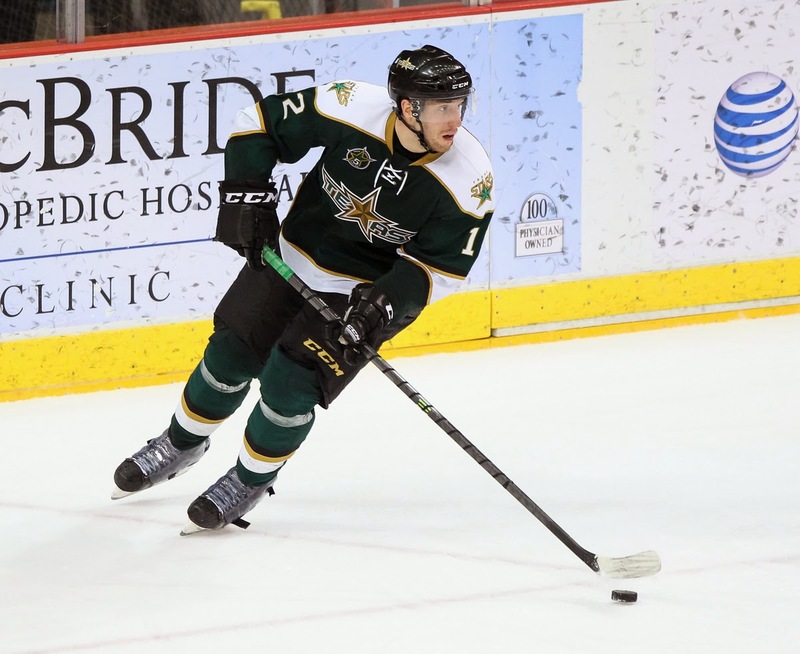 Curtis McKenzie grew up a Canucks' fan; even at more than eight hours by car, Vancouver was the closest NHL team to his hometown of Golden, BC. He now has an added connection with the coaching staff. Coach Desjardins is keeping track of his players all over the world, including McKenzie, even with his new responsibilities. He was fully aware of McKenzie's callup and was very proud to hear the news. "He worked so hard. At one point I didn't even know if he was going to make it into the American League, if he could be a 4th line guy." McKenzie proved he belonged of course, winning the 2014 Rookie of the Year crown in the AHL. Coach Lidster extended Desjardins' point, agreeing that he wanted to see his players do well everywhere. He added with a smile, "Except when they play against us." Joking aside, Lidster is also actively keeping tabs on his former players in Texas and elsewhere. "I know [Texas] has had some good games to start. I've had some texts with Max, Toby and Morin. You try to keep in touch as much as you can. 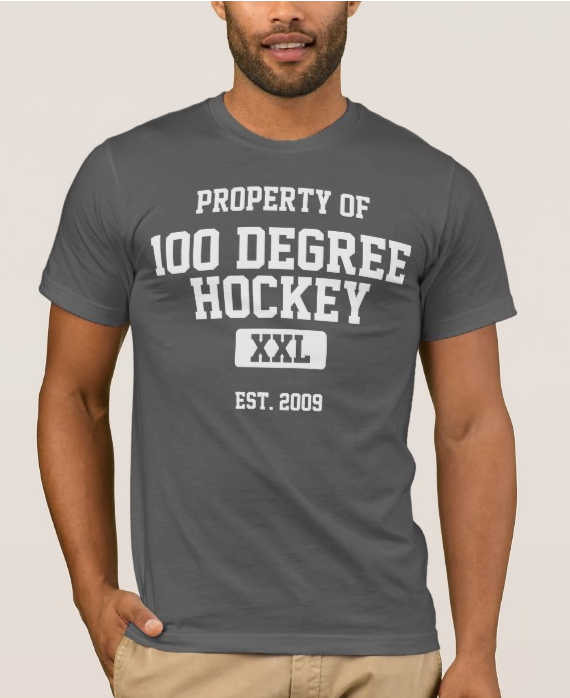 That's the nature of the hockey world. Sometimes you don't talk to someone for six years and then you end up texting them. It's nice to keep track of them." Lidster even noted he had reached out to Francis Wathier to congratulate him on the contract in Portland. It's all about keeping connections in the small world of hockey. Desjardins and Lidster are bringing the same uptempo game that they are known for to British Columbia. Even in morning skate, Desjardins had the Canucks doing drills with a heavy focus on competition and games to keep things light and engaging. With one coach timing the drills, the white and blue teams competed against each other in a 3-on-0 passing and shooting drill on Eddie Lack. The white team lost and had to put in a few pushups on the ice, but it was all in good fun as everyone skated away with smiles. "We're getting complete buy-in," said Lidster. "They're trying real hard. It's not rocket science. After a season like last year, a lot of them are struggling with confidence. That's the key thing for me. If you're confident in your game, you can play any system." 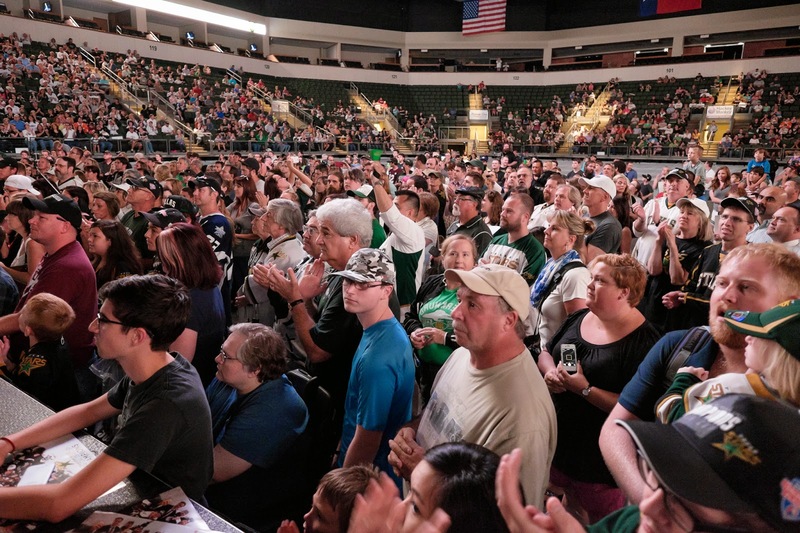 Among the holdovers from last season's struggling Canucks was another familiar face to the Texas Stars faithful: Glen Gulutzan. "It's been an easy transition," said Gulutzan after morning skate yesterday. "It's good for me to see some of the things that they do that I didn't and vice versa. Usually it's not the systems that win but the execution. Every team in the league is playing a little bit differently but 80% of it is the same." Gulutzan credited Desjardins with being an inclusive coach who is really good at bringing people together. "He's done a remarkable job of that with this group: what he's implemented and done off-ice. Those are the things that bind teams together." Desjardins and crew are 3-2-0 after last night's game and will stay in Dallas before heading to St. Louis and beyond on Thursday. The Stars will make two visits to Vancouver, one in December and one in March, but the Canucks will not return to American Airlines Center this year. Well, that is, barring playoffs. And knowing Coach Desjardins' teams, playoffs are probably a decent bet.